On its last day of action in a marathon year, legislators also pass a change to foreclosure law, and some level not-so-veiled criticism at the governor. AUGUSTA — The Maine Legislature adjourned for the year Thursday nearly five months late, but not before Republican Gov. Paul LePage scored one more veto victory and also persuaded lawmakers to pass a bill aimed at protecting the elderly from home foreclosure when they fall behind on their local property tax bills. For a number of lawmakers it was not only the end of a marathon lawmaking year, but also likely marked their last day in the Legislature because they have served four consecutive terms and are prohibited by term limit laws from seeking re-election. Outgoing Senate President Michael Thibodeau, R-Winterport, one of those termed out of office, offered farewell remarks to his colleagues and some advice for the next Senate and the next Maine Legislature, which will be elected in November. “Don’t be afraid to find value in one another’s ideas,” Thibodeau said. “Kindness is not weakness and crass is not conservative.” Thibodeau, who served two terms as Senate president, said he came into office as a fiscal and social conservative and he was leaving office the same way. But he and other outgoing senators seemed unafraid to level some not-so-veiled criticism at LePage. Sen. Roger Katz, R-Augusta, who is also termed out, said the presidents and some Maine governors who he looked up to as a kid took seriously the responsibility of being a positive role model for the people they were leading. LePage once again broke with tradition and did not offer any closing remarks to the Legislature as it adjourned, as other governors have done. Still, LePage garnered support from members of the House Republican minority caucus earlier Thursday when they provided enough votes to sustain his veto of a bill requesting more than $300,000 for the Secretary of State’s Office to cover additional costs headed into the November elections. Last month, Secretary of State Matthew Dunlap asked lawmakers for $334,330 in emergency funds largely to cover costs related to Maine’s use of the ranked-choice voting process. 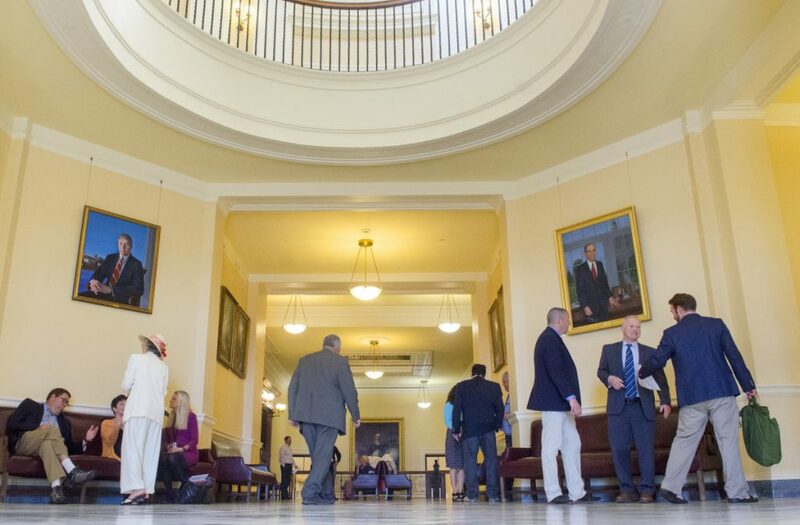 Although some lawmakers were surprised and dismayed by the last-minute request, the bill passed both chambers of the Legislature and was sent to LePage’s desk. That’s where it hit a brick wall and gave LePage – who has exercised his veto authority more than any other Maine governor in history by far – an opportunity to take a few more swipes at Dunlap and the Legislature. Kristen Muszynski, spokeswoman for Dunlap’s office, said his staff will likely have to explore tapping into other funds such as those earmarked for future expenditures in multi-year contracts. The office will then return to the Legislature in January to seek reimbursement for those expenditures. The bulk of the $334,330 is needed to cover the costs of printing additional ballots for the November general election, according to Dunlap’s office. That’s because Maine needs to print two separate ballot sheets – one for candidates and the other for referendum questions – as a result of ranked-choice voting that will be used for the U.S. Senate race and the two U.S. House races in Maine. Those ballots will cost an estimated $246,330, delivering them to municipalities will cost $15,000, and leasing a high-speed ballot scanner and paying for couriers will add another $73,000. In his veto letter, LePage noted that the predicted costs of implementing ranked-choice voting – a process he opposed – changed several times, and he suggested that Dunlap had manipulated those estimates to avoid having to request more money from a “hostile Legislature” before the June 12 primaries. He then said lawmakers “capitulated” to Dunlap’s request last month. The bill passed Thursday to protect against foreclosures for delinquent taxes was amended by the Legislature to require municipalities to try to contract with at least three real estate brokers to sell a property before foreclosing on it. The measure passed the House on an initial vote of 61-34 and later passed by unanimous votes in both the House and the Senate. It remained unclear whether LePage would accept the measure or veto it, but with the Legislature adjourned it would not be able to take a veto override vote. LePage has advocated for the foreclosure law change for months. He first initiated the bill, “An Act to Protect the Elderly from Tax Lien Foreclosures,” after an Albion couple, Richard and Leonette Sukeforth, lost their home on Lovejoy Pond to foreclosure. The town sold the property – worth $70,000 to $80,000, according to LePage – for $6,500 in a sealed-bid auction even though a neighbor offered to pay the back taxes and submitted a bid of $6,000. The buyer evicted the couple, who are in their 80s, while Leonette Sukeforth was sick and in a hospital bed in the home. The buyer demolished the house and constructed another building there. The couple now are in a nursing home. LePage personally intervened when he heard about the matter and tried to help the couple. But he was unsuccessful because all the proper legal procedures were followed in the case. House Speaker Sara Gideon, D-Freeport, also took time Thursday to recognize members of the Legislature who will not return in 2019 because of term limits. She encouraged them to remember fondly their days in the State House. The 128th Legislature first convened on Dec. 7, 2017, and adjourned its second special session on Sept. 13, 2018, marking one of the longest lawmaking sessions in recent Maine history. The last time the Legislature adjourned in September was in 1996, when lawmakers came in for a three-day special session, according to the Legislative Law Library.